A significant portion of the budget pie on Thursday went to the farm sector. Union minister Arun Jaitley, who presented the union budget 2018-19, said the effort was to particularly strengthen agriculture and rural economy and the government was committed to the welfare of farmers. He spoke of prime minister Narendra Modi’s call to doubled farmers’ income by 2022 and announced a budgetary allocation of Rs 14.34 lakh crore for the agriculture sector. He announced a hike in the Minimum Support Price (MSP) on the agricultural produce by 1.5 times on the input cost. In the last four years, the MSP has been substantially low, giving marginal returns to farmers. A recently released paper by Swaraj India shows that the average market prices were below the set MSPs in November 2017. During this month maize was selling at Rs 1,162 while its MSP WAS Rs 1,425. Paddy was selling at Rs 1,431 while its MSP was Rs 1,550. The subsequent drought and poor return has pushed farmers in debt, leading to suicides. Agreeing to the fact that raising MSP is not the only solution, the finance minister announced developing a policy framework and concrete mechanism with the help of Niti Aayog, different ministries and states to ensure benefits can reach the last mile. 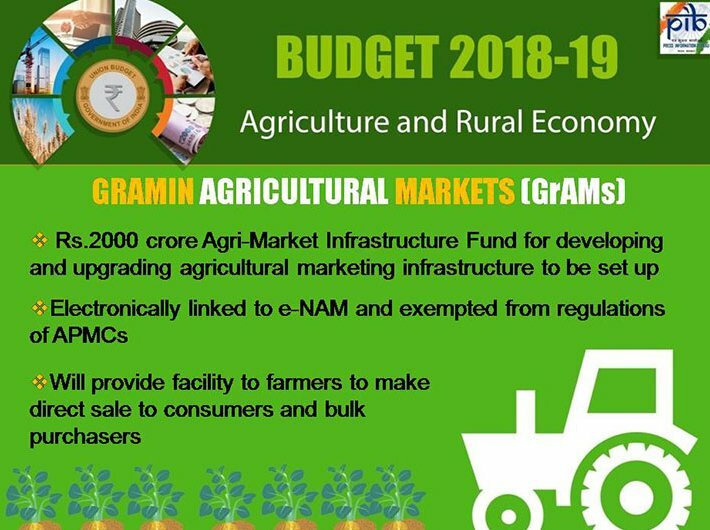 It includes strengthening of 22,000 rural ‘haats’ by converting them into rural agriculture market and connecting them directly to e-NAM (National Agriculture Market) – an electronic trading portal to help farmers in selling their produce. Rs 2000 crore has been allocated for the upgradation. Operation Green is a new addition to bring reform in the sector. The Rs 500 crore project will provide agri-logistic support to potato and onion growers. The government aims to run this project on the lines of Operation Flood by making the market of these perishable items self-sustainable and reducing price variations. Subsidised machinery for the management of crop residue will beprovided to farmers in Haryana, Punjab and Uttar Pradesh so as to tackle stubble burning that leads to air pollution in Delhi. The budget has raised the institutional credit to 11 lakh crore this years and Rs 10,000 crore for the development of fisheries, aquaculture and animal husbandry. Rs 26,000 crore is allocated to Prime Minister Krishi Sinchayee Yojana. The minister announced an increase in funds allocated for the National Rural Livelihood Mission to Rs 5,750 crore in 2018-19, from Rs 4,500 crore in 2017-18. “The focus of the government next year will be to provide maximum livelihood opportunities in rural areas by spending more on livelihood, agricultural and allied activities and construction of rural infrastructure,” Jaitley said.